Weekend Campers may arrive on site on Friday and depart latest on Monday. Each Adult camper must have a valid Camping & Entry ticket. Children 17 and under camp for free. Each Adult camper must have a valid Camping & Entry ticket. Children 17 and under camp for free. Gates will open at 8 am for public, non stop track side action from 8:30am - 4:30pm daily. Festivities start on Friday 17th May with the Benalla and District Classic Car & Motorbike Tour, followed by the Historic Race and Heritage Display which will be held on Saturday 18 and Sunday 19 May 2019. 110 years - Bugatti- with 90 years celebrations of Australian Grand Prix victories 1929, 1930 and 1931. 100 years - Alvis, Armstrong Siddeley, Bentley, Citroen, Salmson. 90 years - Borgward, M Type MG.
80 years - Alta, Ford Anglia, Peterbilt Trucks. 70 years - Austin 7 Club Inc.
60 years - Austin Healey 3000, Datsun Sports, Jaguar Mk II, Mercedes Benz Fintails, Mini, Triumph Herald, Opening of Hume Weir and Barjarg Circuits. 50 years - Formula Ford in Australia. Shannons' Classic Car Park, featuring car and bike clubs plus special interest vehicles. 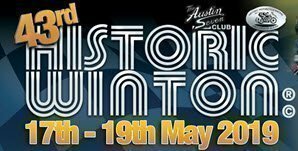 Heritage Displays featuring vintage speedway cars and bikes, microcars, cycle cars, pedal cars, push bikes, dragsters, veteran cars/motorcycles, vintage buses, work vehicles, caravans, speed boats, postie bikes, historic racing lawn mowers and lots more. - Online ticket sales close on Thursday the 16th of May at midnight.